In my opinion, chronic stress is the No. 1 health problem in the United States today. In our modern society, everyone is under some level of stress. Chronic stress is a major risk factor in almost all illnesses, especially high blood pressure, heart disease and diabetes. Can select dietary supplements help the stress response? Recent medical research from Germany suggests that fish oil and phosphatidylserine may help. Stress initiates an important biological response commonly called the "fight or flight" reaction in response to a threatening event. Adrenaline is released enhancing strength and speed. There is an increase in blood pressure, increased release of neurotransmitters and heightened awareness. Once the stress event is over, there is an increase in cortisol and other compounds designed to calm the mind and body. All mammals exhibit these reactions to acute stress. However, we are not built to handle chronic stress. The same chemicals that serve us well in an acute, stressful situation, if released chronically, increase the risk of high blood pressure, diabetes, stroke and heart disease. Some simple dietary supplements, like fish oil and PS may blunt the release of chronic stress hormones. There are three oils that seem to be very important for chronic stress. Two are fish oils, eicosapentaenoic acid and docosahexaenoic acid and one is found in cell membranes, phosphatidylserine. Research has suggested that EPA, DHA and PS may help memory, athletic performance and recovery (more for PS than EPA and DHA) and attention deficit disorder. For people under chronic stress, these oils may harmonize or balance the release of stress hormones, like adrenaline and cortisol. Dietary sources of EPA and DHA are pretty limited -- primarily fish. PS is found in meat, but is concentrated in the brain, liver and kidneys. Brain, liver and kidneys are not common foods in the typical American diet. 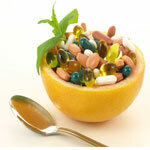 The easiest source for EPA, DHA and PS are dietary supplements. Are EPA, DHA and PS beneficial for people under chronic stress? According to a recent medical study from Germany, the answer is yes. This study, published this year in the medical journal Nutritional Research was a blinded, placebo controlled study involving 60 male volunteers. Half received a supplement containing EPA, DHA and PS and half received a placebo. Both groups underwent a mental stress test at the beginning and end of the study. The results were informative. Those men who had a high stress response at the beginning of the test and then took EPA, DHA and PS for 12 weeks had a significantly reduced response to stress by the end of the study. The data suggests that select dietary supplements can help reduce the damaging effects of chronic stress. Now, there are no supplements or medications that can permanently alleviate the effects of chronic stress. That comes from lifestyle changes -- basically taking serious time to relax and enjoy life. However, nature is always bountiful and has provided compounds that can lower the effects of chronic stress. * Patrick B. Massey, M.D., Ph.D is medical director for complementary and alternative medicine for the Alexian Brothers Hospital Network. His website is alt-med.org.